I wanted to share with you my newest completed design for my client. This nursery was so fun to do. This client already has a little girl, so we wanted to make sure the two rooms were very different. 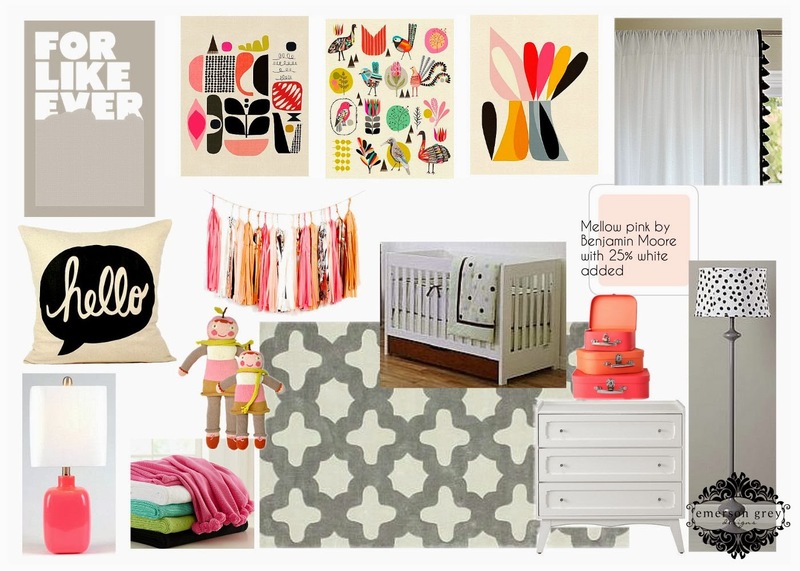 For the new baby’s nursery I went with shades of corals and pinks, grays with pops of black through out. I can’t wait to see this room come together. The abstract prints were my jumping off point. I just love the movement and fun that they exude and I thought the birds of Australia print had such a whimsical feel to it. The crib was existing, but everything else is fresh and new. A little black tassel trim to the white drapes pulls out the black in the prints and a black “Hello” pillow brings a bit of the color to the glider. And you can’t go wrong with a black and white polka dot lampshade. This room just screams fun. Out of respect to my paying clients I do not provide sources, please contact me if I can answer any of your questions.